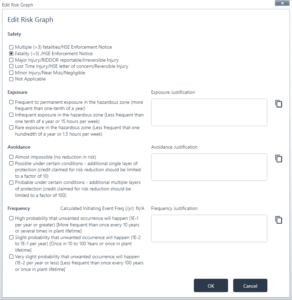 The Risk Graph can be access by clicking on the required Hazard ->SIL Determination -> Risk Graph. The default Risk Graph is pre-configured and can be changed to your company standard Risk Graph as part of the ProSET® license. To assess a Consequence, right click on the Consequence row and select Edit Consequence. Some parameters are disabled based on the Risk Matrix and the selected Consequence level. The Initiating Events tool is available when conducting a Risk Graph based SIL Determination to calculate an Initiating Event Frequency. This frequency is displayed when assessing a Consequence in the Frequency section. The frequency is a guide to assist in selecting the correct Frequency option. Changing the Determination Method when Editing a Hazard could disable the Risk Graph section. This will NOT delete any entered data and the data will be available again if the Determination Method is changed to include Risk Graph. If the Selected Target was a Risk Graph assessed Consequence the Selected Target will be reset.